Wikki Tourists of Bauchi moved two points clear at the top of the Nigeria Professional Football League table after a hard fought 1-0 win over El-Kanemi Warriors of Maiduguri in a match day 21 clash at Tafawa Balewa Stadium, Bauchi on Wednesday, Complete Sports reports. Abubakar Lawal’s 57th minute strike separated the two sides and earned Wikki all three points as they moved two points clear with 37 points. Wikki won the reverse fixture with similar goal margin. 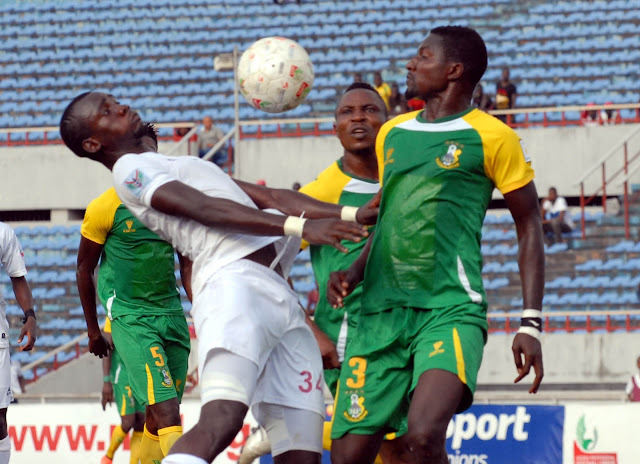 At the Nnamdi Azikiwe Stdaium, Enugu Rangers laboured to a slim 1-0 win over Kano Pillars to move to the second position on the log. The defeat was a painful one to take by the Sai Masu Gida side whose defender, Adamu Murtala, turned the ball inside his own net 11 minutes after the restart to gift the home side all three points on offer. It was a six-goal thriller at Nest of Champions Stadium, Uyo, as Sunshine Stars fought to hold Akwa United to a 3-3 draw. Dele Olorundare’s stoppage time goal earned the Akure side a share of the spoils in the game. Heartland of Owerri who conceded a second home defeat of the season following a 1-0 defeat by Enugu Rangers in match day 20 at Dan Anyiam Stadium, Owerri, came close to grabbing their first away win of the season at Warri Wolves but a late rally by the Seasiders saw them earn a point in the 2-2 draw. Heartland would have themselves to blame for the draw after going 2-0 up. Mountain of Fire and Miracles, MFM, of Lagos at Agege Stadium, Lagos, completed the double over Nasarawa United following a 2-0 win. MFM won the reverse fixture in Lafia 2-1. Sikiru Oluwatosun hit a brace, scoring on 18 and 28 minutes to hand manager Fidelis Ilechukwu a deserved win. In Makurdi, Lobi Stars defeated Shooting Stars 3-1, a result that saw the Godwin Uwua charges earn a double win over the Oluyole Warriors this term following a 1-0 win at Lekan Salami Stadium, Ibadan, in the reverse game.